Oh no.. poor baby boy..
I’m so very sorry. There are no words, but we understand your grief. Oooooo no….we were really rooting for him. Such a precious pup. Whether day one, or year 16, it still hurts to lose your baby. Please accept our heartfelt condolences. Sooooo sad! You did all you could. I guess he was meant to get his snort in frenchie heaven….he’s in great company! Sorry for your loss Carol. I trust the other are all doing well. I’m sorry for your loss… I know how quickly I get attached to my orphaned foster kittens. I’ve got the remains of a five day old black kitten named “Miles” in a little urn on top of my desk. I can’t read your words without tears. 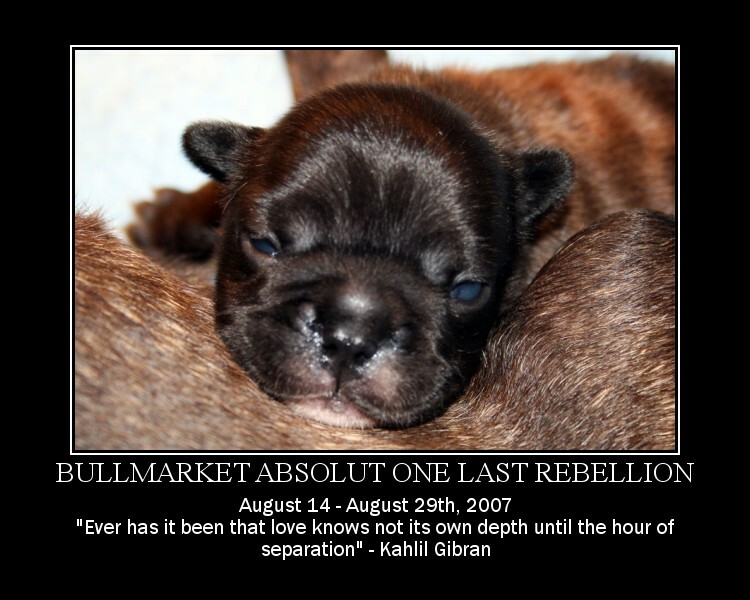 Although it’s been almost three years since I lost Absolut Bullmarket Byllie, the wound sometimes fades, but never heals. The pain can come back with a vengeance that is surprising. But we have no choice but to go on, do we?